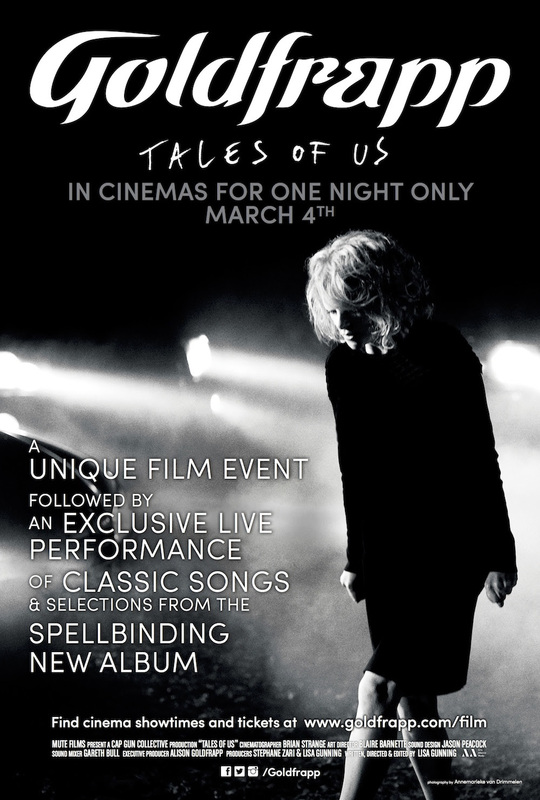 March is shaping up to be a very exciting month for us with our Tales of Us cinema event taking place on March 4th, our UK tour kicking off in Birmingham on Mar 26 and the release of the first set of remixes from the ‘Tales Of Us’ album for 'Thea’. One of our favourite songs from the album, ’Thea’ has been reworked by Twin Shadow, Blood Diamonds, WAWA and Red Top. You can have a listen to the first remix from Twin Shadow here. As you all know, our #TalesOfUsLive cinema event will be streamed live in cinemas across the US and Canada on Tuesday March 4th with encore presentations taking place Tuesday March 25 and Thursday March 27. We recently announced the first set of cities and cinemas taking part at goldfrapp.com/film and are pleased to now add a whole host of new US, Canadian and Dutch cities including Brooklyn, Vancouver, Raleigh, Montreal, Tilburg and Dallas. Cities announced previously include New York, London, Toronto, Vienna, Manchester, Los Angeles, Berlin, Miami, Glasgow, San Francisco, Amsterdam, Atlanta, Dublin, Chicago, Belfast, and Seattle amongst many more. Be sure to pre-order your cinema tickets for all cinemas offering pre-sales before they sell out. Further cities and cinemas will be added over the coming weeks, including dates in Australia, New Zealand and additional countries across Europe, so check back often. Taking inspiration from our latest album, the Tales Of Us film is a 30-minute journey through five of the stories featured on the album, namely: Stranger, Laurel, Jo, Drew and Annabel. By interconnecting the films and themes, we hope to take viewers on a unique journey. This is an incredible opportunity to see the Tales Of Us film as it was originally intended: up on the cinema screen followed by a live performance transmitted into cinemas from the legendary Air Studios in London. You can watch the film’s trailer here. We look forward to sharing the 'Tales Of Us’ film with you on March 4th. Visit our film microsite for more details here and be sure to tweet us your thoughts using hashtag #TalesOfUsFilm.